As the holiday season comes to a close, many of you are wrapping up your chosen seasonal traditions. A typical Christmas in my family includes a snowshoe trip into the mountains to find the perfect tree…which is usually barren on one side from crowding a less fortunate soul, my dad’s justification is that we are simply thinning the area to allow another tree to thrive. Whether or not our tree was fortunate enough to survive Christmas Day (there were years in the tumultuous youth of our blended family that the tree was thrown out the front door halfway through Christmas morning, lights, ornaments and all) it was typically turned into firewood shortly thereafter. These days most households don’t have fireplaces and other forms of Christmas tree recycling have come to fruition. So what are your options for responsible tree disposal? 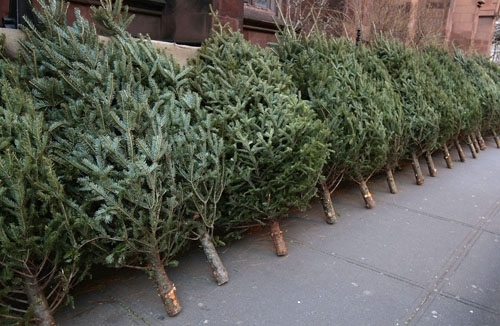 Most communities now have drop off locations for Christmas trees – check your local city or county website to find out what kind of recycling options they offer. Remember, trees are biodegradable; lights, ornaments and tinsel are not, so...naked trees only please! Trees from community collection centers are used in a variety of applications. Commonly the trees are simply ground into mulch or wood chips and added to gardens, walkways and hiking trails. Some locations will have a “give away” program where residents can pick up mulch for use at home. In many states, Christmas trees are used for erosion control, soil stabilization and stream bank and shoreline maintenance providing a valuable habitat for local wildlife. Louisiana has implemented a successful program that uses discarded trees in fences along coastal marshes to protect the coastline from saltwater intrusion and to aid in sedimentation. They undertook this creative preservation and restoration program because the state was losing 25-35 square miles of marsh each year. If you missed the drop off period in your community, another option is to find the nearest composting facility. They will typically charge a small fee but you can be sure that your tree will be mulched or turned into compost.